Quitting your job can be difficult and intimidating, even when you feel confidence that you’re making the best move for your career. One of the trickiest mental scripts to wrap your head around is having that dreaded, “This is my two weeks’ notice” conversation when quitting your job. 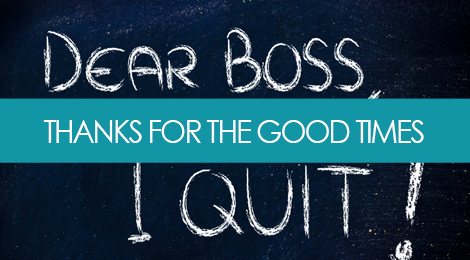 Depending upon the role that your work plays in your life, quitting your job can be the most rewarding and/or agonizing experience in your professional career. I would know, as I’ve done it about 7 times over the course of 15 years. Each of the following situations reflects a common scenario that many of us have, or will, experience in some point as we move between jobs and careers. From informing a team that you’ve become emotionally attached to, to breaking off to explore a new path altogether, the fact still remains – breaking up is hard to do. And the conversation around it can be quite difficult to wrap your head around, and awkward to execute. One of the jobs that kept me on my feet while also keeping me involved in the HR world as I really started to build my business was my contract recruiting job placing advertising, marketing, and creative professionals in New York City. The challenge here was one similar to what I felt when I quit my other recruiting job in Boston – the agency I worked for was owned by a colleague of mine whom I respected very highly, and I had also come to enjoy working with my remote team. Alas, they all knew that I had a business outside of my work as a recruiter, and that my ultimate goal was growing into my resume writing work full time. I’ve really enjoyed being a member of the team, and it has been a pleasure working with all of you. As you know, I’ve be working very hard the last few months to build and grow my resume writing business, and it’s really been taking off as of late. It’s with mixed feelings that I am moving on, but I’m really excited and grateful to have the opportunity to focus my energies on this new project. After quitting my full time job to start my business, I took on an interim freelance gig doing some recruiting and administrative work for a small design firm in New York. I was well over-qualified for the role, but I really enjoyed being around a team of creative designers, and it was an opportunity to keep my recruiting and HR skills fresh while financing the start of my business. About 4-5 months into the job, my supervisor and I came to a mutually agreed upon decision that I was overqualified for the role, and that there really wasn’t enough work to give me. I’m really glad that my work has provided real value for the company. As you know, I’ve spent a number of years in recruiting prior to this, and I think I’d like to focus on something a bit more challenging that will allow me to take on more responsibility, and explore more growth opportunities. I had been working as a client services manager for a technology research firm for a year and a half when it was decided that the company would be sold. I was one of several employees offered a bonus to stay onboard through the transition with the new company, but I already had long-invested plans to move on and start my own company. The challenge here was how to deal with the bonus/counter offer, and the guilt and awkwardness that comes along with that. I am appreciative of the fact that you value my work so highly that you’d like me to remain a part of the team. While this is an incredibly generous offer, I have given it some serious thought, and I believe this is the right time for me to consider pursuing a different opportunity [that I’ve been presented with]. This was by far the hardest job to quite in my career. Not only did I love the people I worked with, but they had become close friends, respected colleagues, and essentially a family. On top of that, I was managing the office and felt a certain sense of personal and professional responsibility to my team that made it especially difficult to cut ties. I had just come into my office in Boston from an all-night bus trip back from New York where I had been out celebrating my new job offer the night before. Despite the fact that my colleagues had seen it coming, I thought long and hard about how to start off the conversation, as I would have to do it twice – once with my team, and again with my regional manager on the phone in Chicago. It has been such an honor and pleasure to work with you. As you know, it has always been in the back of my mind to move back to New York City one day, and I was presented with a great job opportunity that I can’t pass up and that would make that a reality for me. I will miss working with all of you, but I’m also incredibly excited about this new chapter in my professional career. In most cases, there’s no way around it – quitting a job can be an awkward situation, but bear in mind that most hiring managers have been through this before. It comes down to your professional growth, and what makes the most sense for your career. Always leave on a positive note, avoid burning any bridges as much as possible to ensure your future connections, opportunities, and relationships are safeguarded against potential negative press. And whenever possible, set the stage with your supervisor or colleagues to reach out later for a recommendation or reference on your work. Tags: career, cover letter, hr, interviewing, job search, LinkedIn, marketing, personal branding, quitting, resigning, resume. Bookmark the permalink. Great article..I’m going to quit my job soon was searching to some nice tips to follow to quit my job your article helped me.